Six members of Keswick AC attended the 35th running of the Three Shires fell race on Saturday. At 12.4 miles, it is the shortest of the “Lakeland Classic” fell races, but with over 4000feet of climb packed into those miles, it’s certainly not an easy one! Despite the forecast, the sun shone for the majority of the race, and over 170 people enjoyed the challenging course, taking in Wetherlam, Swirl How, Pike O’Blisco and Lingmoor summits before collapsing at the Three Shires pub, the race’s start and finish point, with a well-earned pasty and cup of tea. To celebrate the race’s 35th anniversary, all entrants were presented with commemorative mugs at the finish line. 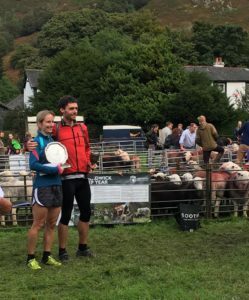 Keswick AC’s Dave Birch continued his run of recent form, achieving 8th place overall and 2nd MV40, narrowly beaten by Rhys Findlay-Robinson of Dark Peak, another Keswick local. Kerry Cornforth of Borrowdale took 3rd lady overall and second LV40, ahead of Keswick AC’s Rachel Findlay-Robinson and Zoe Webber who were 8th and 9th ladies respectively. Lesley Malarkey took the LV60 prize, showing the youngsters how it’s done! Our thanks go to the marshals and organisers of Ambleside AC, and may the race continue for another 35 years! 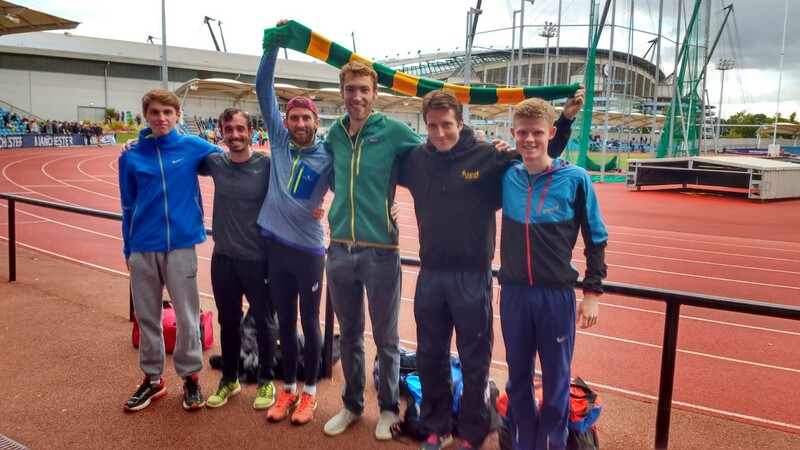 A team of six Keswick runners took on the best road runners in the region on Saturday at the Northern 6 Stage Road Relay Championships. Starting and finishing at the Manchester Regional Arena, each runner completed a 6.5km loop in the shadows of the Etihad Stadium. 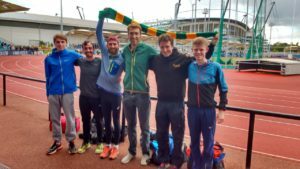 The team had a youthful look this year, with two 17 year olds getting their first taste of relay action, alongside some more “experienced” runners. Meanwhile on Sunday, early cloud on the mountain tops cleared to leave terrific conditions for the final Keswick AC fell club championship race of the season. 61 runners lined up to tackle Dale Head, via a tough straight up and down route from Rosthwaite. The water level in the River Derwent had dropped enough to let athletes splash their way onto the fell, and Borrowdale’s Ted Ferguson took an early lead on the way up to the quarry. Supporters of all ages dotted the route, providing welcome encouragement to all runners on the gruelling climb. When it came to the descent, Keswick AC’s Carl Bell was in his element, and returned to the Rosthwaite show field first in a time of 46:38, but with Ted Ferguson a very close second. Meanwhile, Jo Gillyon was making it a double for Keswick AC by winning the women’s race in 71:05. 1st Carl Bell 7th Alastair Thomas 12th Andrew Slattery 14th Craig Smith 20th Chris Brewer 21st Pez Bullen 22nd John Beetham 23rd Tom Day 28th Michael Mallen.